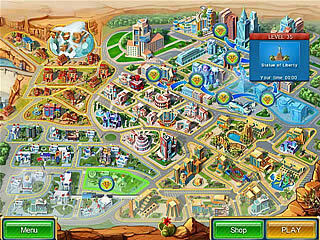 The title of this game, Hotel Mogul: Las Vegas, gives it all away. I mean what else can you add to it? You are going to be involved into building hotels in Las Vegas. Even though, there isn't too much to add to the story, I would still like to tell you about it in more detail. The game gives you a simple tutorial, but you won't even need it if you played any of the games alike. In this game are are given a choice as to what you want to look like. Once you have chosen your avatar, you get to business. You are going to be busy with developing Las Vegas branch. That means a lot of hotels and other buildings to be built. You get tasks for every level, all which are shown on a map. 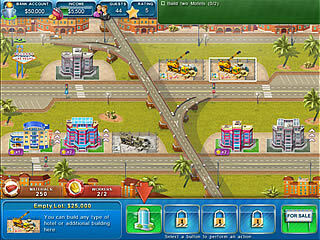 The tasks may include reaching a certain number of stars or a certain amount of income or building a certain number of hotels. You success with all of that is then followed on the game's screen. So you won't forget what to do. You will also have a chance to buy some upgrades as you go shopping in between the levels. The tasks that the game gives you are often challenging. But things get quite repeatative after awile. The graphics are bright and sunny as you would expect from a place like Las Vegas, but not too sophisticated as you would expect from a hidden object/adventure game. Maybу it is because I'm not a fan of this kind of games, but I do believe you better check out the free version first. This is Hotel Mogul: Las Vegas review. Download this game here.